Few would contest the notion that all of us would be better off with a bit more space, whether it be mentally (as in a relationship) or physically (as in living quarters). This also holds true in a technological sense – more disk space is a desirable quality that many look for in devices. However, the search for lots of gigabytes has not been favorable as more gigabytes often equate to higher prices. Thus, the cost of laptops and mobile phones can go up by hundreds of dollars to upgrade to high capacities. Even for smaller devices which are used solely for data storage, the cost often goes up with the high capacities as well as the size of the unit (external hard drives are usually the go-to device for more disk space), thereby limiting the mobility of your data storage unit. Can affordability, performance, convenience and plentiful data storage in one device be possible? Certainly it can, and with another sought-after feature – durability. Patriot’s Supersonic range of USB 3.0 flash drives tick all of the boxes while keeping up with the most adventurous of USB flash drive owners with its tough design. The Patriot Supersonic range consists of the Supersonic Rage XT, the Supersonic Boost XT and the Supersonic Pulse. 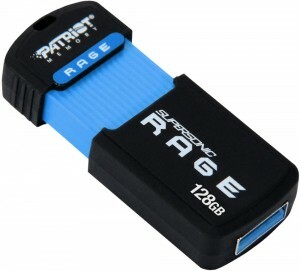 The Supersonic Rage XT is the line’s top performing USB flash drive with up to 180 MB/s read and 50 MB/s write speeds. It comes in 32GB, 64GB and 128GB and is protected by rubber to safeguard against minor drops, scratches and spills, as those occurrences are unavoidable and should not cost you all of your data. The Supersonic Boost XT is the toughest in the lineup with its durable rubberized housing that is actually water resistant, thereby providing the ultimate protection against the harshest elements. This USB flash drive comes in a wide variety of capacities (8GB, 16GB, 32GB, 64GB, 128GB and 256GB) and has a read speed of 150 MB/s and a write speed of 30 MB/s. Finally, the Supersonic Pulse is considered to be the cost-effective of the family with its 8GB, 16GB, 32GB, 64GB and 128GB capacities, durable aluminum exterior and 120 MB/s and 20MB/s read and write speeds. Patriot’s line of USB flash drives offers what few others can; topnotch performance, compact size, tons of data storage and unparalleled ruggedness all in one convenient device. This entry was posted in Patriot and tagged Patriot Memory, patriot rage, Patriot Supersonic USB 3.0 flash drive, USB 3.0 Flash Drive. Bookmark the permalink.